Raise your hand if you believe that using Google Analytics can affect your site’s SEO rankings. Now raise your other hand if you believe Google Adwords also affects your SEO. If you’ve got both hands in the air keep them that way, as having your hands off of the keyboard is probably the best SEO strategy for your website right now. 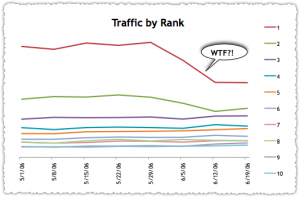 I had been under the impression that Matt Cutts put this myth to rest several times (see video below) however some recent forum threads make it hard to maintain faith about the general public’s SEO opinion. It’s not just SEOs either. I’ve seen this level of thinking with fortune 500 clients as well. In fact, I’ve even seen some analytics platforms use the “don’t share your data with google” angle in their sales pitches. By the way, if you clicked that link I know what you’re thinking and yes, I read black hat forums. Is there something wrong with that? Sadly, (and chime in if you can think of one) there’s no proper controlled way to test this. 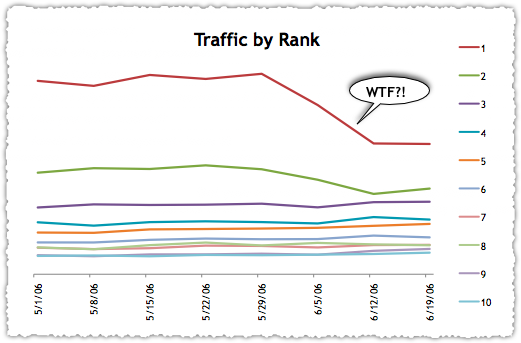 Since we can’t scientifically prove that Analytics has no effect on SEO, there’s only a couple of ways we can look at this. That’s well and good, but I know exactly what people like Graywolf are going to say here. “Why would Google tell you the truth if they did use it? Wouldn’t that just get you to stop using their products?” And I agree. If you already believe it’s a conspiracy, taking the conspirator’s word for it doesn’t help much. It’s like trying to use the bible to prove God exists. Let’s move on. People have been claiming ill effects after installing GA for years on webmaster world. But does that make it so, or is it simply a timing or correlation/causation mistake? We’ll never know because webmaster world doesn’t let you list sites for examples, but I’d be willing to bet I can look at any site claiming this and come up with other non GA reasons why the rankings are down. So anecdotal evidence didn’t provide much help. I can find some for and some against, but that’s exactly what I expected to find – since if all the anecdotal evidence said the same thing we probably wouldn’t even be asking the question to begin with. 3. We could look at things from Google’s point of view. When all else fails, this is usually the best bet. WWGD? (site note: maybe I should start selling WWGD wristbands) Whenever I’m in doubt about something in SEO I put on my software engineer hat and think of things from Google’s point of view. To me, it wouldn’t make sense to use Google Analytics data in rankings. There’s several reasons for this. Google doesn’t need to use your analytics data, their index contains most of it anyway. Think about it. What can google get from your Analytics account that a good index of the web wouldn’t already tell you? They know about all of your pages, they know what sites link to your pages, they know how many clicks you get from search, and they know what keywords you rank for. They also know all of this about all of the sites linking to you. Sure there’s other data they can get from analtyics like paths, funnels, conversion rates, etc – but none of those things really make sense to use in rankings. Think about it, how would what the visitor does once they’re on your site affect whether or not your site is relevant for a term? It wouldn’t! So just looking at their search index, with a little recursion Google can get all the ranking relevant information without needing analytics – so why use it? From an engineering perspective it would be both slower AND more complex to do so. Plus, what would happen if they ever discontinued analytics? The search engine wouldn’t work without it – and that type of dependency doesn’t fit the Google model of scalable thinking. It would also be a PR nightmare. Think about what would happen if word got out that they DID in fact use analytics data? Danny Sullivan would be all over it, Privacy groups would be up in arms, the EFF and ACLU would file lawsuits, the Times would run a front page article, Jesse Jackson would hold a prayer vigil, Graywolf and Pageoneresults would be screaming “I told you so”, and that would bring about the twitter fail whale. They’d never live down the bad PR. If you don’t think Google takes these things into consideration, perhaps it’s best you raise your hands up in the air too. There are few in this country that have the power to nuke China off the face of the earth on their command. Having the power does not make them evil. Using that power..??? My point, is that Sun Tzu believes you should know all the tactics available. All the tactics your competition could use. Knowing black hat tactics is one thing. Using black hat tactics is another. One word… quality, which is often referred to in relation to two words, bounce rate. This is what it really comes down to. However there are many other pieces of data that google would never know without analytics. You pointed out only a handful that do frankly have nothing to do with ranking. What else could be important to google? WWGD? Gee, for an advertising company, seeing other sources a site might be getting traffic from could prove useful. I think it comes down to the quality though. Does the visitor stay or bounce in 30 seconds? Stay = rank up, bounce = rank down. Complexities in integrating an additional signal are not all that hard. An ‘if’ here and an ‘else’ there and presto, you got more data for your decision making.. in this case, decision to rank. As far as privacy goes, googles own terms give us peace of mind knowing that our data will never be whored out to a 3rd party. No, it will just be used in the googleplex and passed around for their own pleasure. What happens in google, stays in google. Solution, don’t go to google. 🙂 .. or in this case, don’t let google see your otherwise ‘private’ parts. Ok let’s start at the top and dissect your concerns. 1.) Bounce rate. Google knows this already. By using your global cookie and timing when you left the search results and how soon you come back to the same search results, they can effectively know that you clicked the back button. Bounce rate FROM search would be a way more valuable metric than overall bounce rate for your site, so why would they use the less accurate one? Example, if you buy an ad with the keyword “blue widgets” and point it to the “red widgets” page, it would achieve a high bounce rate for those visitors, however not for visitors from google who searched for “blue widgets.” Google (if they wanted to use this, I’m not saying they do) would have much better relevancy by using the search data, not your analytics data. 2.) Google’s stated goal (and the one that best helps their search engine) is to return relevant results for the given query. Knowing what other sources deliver traffic to your website doesn’t have anything to do with whether or not your site is relevant for that query. However, even if it did, this information is already contained in their index as Google’s index includes every site they’ve found that links to yours. Why would they go out of the way to pull it from your analytics account when it’s already built into pagerank? Valid concerns, but easily shown not make much sense for Google to do. Ryan, I like this post, so you can vote its message up here: Ryan’s plea for common sense & logic. I have noticed all his hype about how Google chooses the website on page one. Customisation works by looking at the websites that you find popular and dropping a cookie into your cache. This in my opinion means that Google is actively looking at what you like and basing its index on that, so I ask you wouldn’t google use the data provided by all its own products to help it choose. Ie adwords, places, shopping.